Drawn by the promise of political and religious freedom, and by the availability of rich farmlands across Pennsylvania's southeastern frontier, tens of thousands of European immigrants moved west into the Piedmont and Ridge and Valley regions of eastern Pennsylvania in the decades preceding the American Revolution. The sweeping social and cultural diversity of this "best poor man's country," made colonial Pennsylvania the most ethnically diverse region in eighteenth-century British North America. It also made frontier Pennsylvania a seedbed of social conflict that sometimes exacerbated long-standing grievances. No one kept accurate statistics, but the growing number of frontier settlers included close to 60,000 Scottish and perhaps 30,000 Scots-Irish immigrants, most of whom affiliated with the burgeoning Presbyterian faith. An immigrant people with a transplanted Calvinist religious outlook, these Presbyterians organized themselves into a model of denominational polity with seats (or presbyteries) in New Castle, Delaware, and in Philadelphia and Donegal, Pennsylvania. By the eve of the French and Indian War (1754-1763), a substantial and diverse population of Scots-Irish Presbyterians had inhabited the Susquehanna River Valley and pushed westward through the Cumberland Valley. The most conservative of these Ulster Presbyterians were known as Covenanters, and later as Reformed Presbyterians. Born circa 1715 in Monahan, County Antrim, Ireland-the northern province of Ulster-Joseph Junkin was steeped in a Scots-Presbyterian culture that had deep roots in the Protestant Reformation throughout the British Isles. 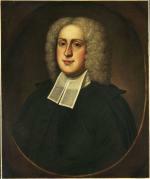 Junkin and his forbearers were part of that branch of Presbyterianism heavily influenced by John Calvin and by the growing Scottish opposition to an established or government-sanctioned Anglican church in England and Scotland. In the Covenanters own words, they had seceded from "both ecclesiastical and civil tyranny" that deprived them of liberty of conscience and free worship. Henry Dawkins, The Paxton Expedition, 1764. Coincidental with the wave of trans-Atlantic religious revivals known as the Great Awakening, Junkin emigrated in 1736 with his wife and two brothers, eventually settling some six miles east of Carlisle in the vicinity of New Kingston. The hard-scrabble existence of farming on the Pennsylvania frontier reinforced a sense of mission and purpose for these stalwart Presbyterians, who, much like the New England Puritans, fashioned themselves a "righteous remnant" or chosen people imbued with a special purpose and calling. Anti-authoritarian in their politics and possessed of a Calvinist theology ideally suited for the rough and tumble of frontier life, Pennsylvania's Scots-Irish could be deeply suspicious of both Philadelphia's ruling Quaker aristocracy and local Native-American tribes. Soon after their arrival in what is now Cumberland County, Joseph and Elizabeth Junkin established a "tent," or outdoor meeting place of worship and social fellowship. 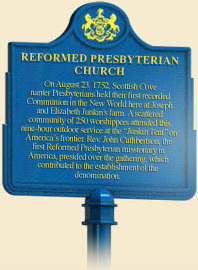 On this site, on August 1752, John Cuthbertson, a leading figure in trans-Atlantic Reformed Presbyterianism, served more than 250 communicants in the first Covenanter communion in the New World. Among those baptized were the Junkin children, whom Cuthbertson made a point to visit whenever he traveled through the region. The Junkin House, New Kingston, PA, circa 1900. The "tent" itself was little more than a modest covered platform that sheltered the minister, as the congregation-if that is the right word-gathered around in prayer and fellowship according to the traditional Presbyterian rite of worship. An open bible rested on a plain wood board adjacent to the primitive pulpit. Their style of worship conformed to their modest economic station, and to their firm resolve to avoid extravagant rituals that smacked of ecclesiastical hierarchy. Their traditionalism seemed to some not only primitive but "radical" in its devotional presentation. In many respects, the scene calls to mind the modern camp meetings still popular across rural Pennsylvania. Following the passing of the elder Joseph Junkin in 1777, Elizabeth and their children continued to maintain the outdoor worship center adjacent to the family homestead. According to grandson David, the site, "known from my earliest memory as 'Widow Junkin's tent,' stood three hundred yards from the dwelling first erected by my grandfather" in 1747. The "tent" was later moved one mile west to a site adjacent to Bell's Tavern. Junkin's Tent is a testament to both the large Ulster Scot (or Scots-Irish) presence on the Pennsylvania frontier and to the vibrancy of Presbyterianism in the religious and cultural mix of eighteenth-century colonial life. It also serves as a reminder of the theological diversity within Presbyterianism-mainstream and more conservative Reformed and Cumberland Presbyterians communities-that was fast surfacing as a religious and political force for the generation that declared its independence from England. In the era of American independence, church affiliation proved to be just as significant as political ideology in determining the shape of government policy in Revolutionary Pennsylvania. Despite internal differences, Scots-Irish Presbyterians as a group were remarkably unified in their support of rebellion against England and its state church. As the Junkin tent revivals witnessed, what also took shape within the American Great Awakening and Presbyterianism itself was a conservative religious tradition that has continued to this day. Steeped in a stern Calvinist religious ethic, the spiritual descendents of Pennsylvania's frontier Presbyterians are still evident within mainstream conservative Christian movements today. W. L. Fisk Jr., "The Diary of John Cuthbertson, Missionary to the Covenanters of Pennsylvania," Pennsylvania Magazine of History and Biography 63 (October 1949): 441-58. James H. Smylie, Scotch-Irish Presence in Pennsylvania (University Park: Pennsylvania Historical Association), revised edition 2000.